A common characteristic of cancer cells is their reliance on the enzyme poly-ADP ribose polymerase (PARP) for DNA repair, making PARP an attractive target for tumor therapy. 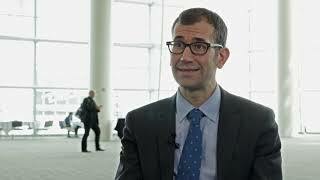 Petros Grivas, MD, PhD, of the Seattle Cancer Care Alliance, Seattle, WA, talks about the aims and implications of the Phase II ATLAS study (NCT03397394), investigating the efficacy of PARP inhibitor rucaparib in the treatment of urothelial carcinoma. This video was taken at the 2019 Genitourinary Cancers Symposium, held in San Francisco, CA. Atlas Trial is a single arm phase II trial evaluating the safety and efficacy of the PARP inhibitor Rucaparib, which is inhibiting a main enzyme that is involved in the repair of DNA. And the context here is that urothelial cancer like ovarian, breast cancers, and other cancers, have inherent defects in genes that are responsible for the repair of the damaged DNA. So, DNA damage response ends. If you have defects, mutations in those DNA response repair genes, you have an inherent vulnerability or susceptibility to PARP inhibition because the cancer cells are dependent on PARP to correct or repair that DNA damage. So, in that context, PARP inhibitors that are aiming to inhibit that enzyme may actually induce lethality in cancer cells just because of this dependence that the cancer cells have in this enzyme, PARP. So, in that context, in urothelial cancer, we have a significant frequency of homologous recombination deficiency and also what we call loss of heterozygosity, which is a mark of genomic instability, genomic scar. So, we think that this agent, Rucaparib, can inhibit PARP and thus hopefully can induce responses, and we’re aiming for a response rate at least 20% or more in this single arm phase II study. It’s a registration trial, and we decided to take all comers, not focus only on the patients with tumors with DNA repair gene mutations, but go in the entire spectrum of patients with or without homologous recombination deficiency, because we think that the agent may have activity even in patients that are wild type not mutated for those genes. So, it’s a 200 patient trial open in six countries, United States, France, Italy, Spain, Germany, and U.K. and we are aiming to enroll 200 patients right now. We are enrolling well. The trial is ongoing. We don’t have any results yet, but the significant enthusiasm with the rapid accrual and hopefully will answer the question whether single agent PARP inhibition has significant impact in bladder, urothelial cancer patients, in metastatic disease, and we’re focusing mainly on second and third-line in the advanced disease space after platinum-based chemotherapy and/or checkpoint inhibition in this second and third-line space of advanced urothelial cancer. And we’re going to evaluate the plethora of biomarkers, both in tumor tissue and in the blood.